We all grow up believing that we we should be afraid of things that go bump in the night, but whereas all of these ghouls and ghosts are creations of human imagination, there is some else lurking out there that you truly should be concerned about – things that skitter and crawl in the night! The umbrella of what defines a pest is fairly broad, but you can generally take it to mean any kind of animal presence in our homes, offices and other buildings that are not welcome. As you can imagine, this can range from insects to rodents and cover a myriad of different species in between. They all do share a commonality though, none of them will have been invited to live where they are living, and they are all capable of causing significant damage to the property, adverse health conditions in humans, or both. The other big issue that they all tend to present, is that they are usually quite difficult to remove and cause a big headache to the property owners as they cause a large number of issues in several different ways. Although all pests are capable of causing damage to one extreme or another, by far the kings of damage potential have got to be termites. These insects are only around 10mm in length but they can cause untold damage to your property should they be allowed to establish themselves. A termite queen can lay ten or more eggs in a day whilst founding a colony, but this rate can increase exponentially as soon as they are comfortable. The problems with termites stem from integrating our way of life with theirs, as in the wild termites feed primarily on the dead wood of trees and other decaying plant matter, helping the ecosystem by providing a composting effect. Unfortunately for us, a large part of our homes and buildings are comprised from dead wood. As such, the termites simply see a buffet and that is a big problem for us; by eating their way throw the timbers in buildings they will eventually weaken the structure and can cause it to collapse. This usually takes a while, but depending on the species of termite you are dealing with you could be measuring this span in months. This is a bit more of a close run race, but arguably the biggest risk of illness from pests comes from cockroaches. Rats are a very close runner up but rats also engage in rigorous social grooming so cockroaches take this one. Cockroaches spend their lives trawling through highly unsanitary environments such as sewers and landfills as they will feed on just about anything that they can find. This in itself is not a huge problem, but these places are also prone to a large variety of infection causing bacteria which will use the cockroaches as transport and this can bring them into contact with people. So, although the cockroaches themselves aren’t specifically prone at causing sickness, they are very capable of triggering allergic reactions in people. These symptoms will present in a very similar way to dust mite allergies, but obviously no amount of dusting is going to tackle the problem, which for some sufferers can lead to asthma and even anaphylaxis. Whilst we are discussing sickness, it is hard to overlook spiders. Australia is famous for being home to a lot of species of venomous spider and being bitten by one can cause serious health problems. Spider control and removal is a science all of its own as they are very persistent and unpredictable in the ways they move and when they decide to attack. Not knowing how to identify a highly poisonous spider from a safer one can put you in significant danger, but between them spiders and cockroaches can cause a wide array of sicknesses and health problems and you should always call in an expert if you suspect either are moving into your building. Whatever kind of pests you are facing, there are some common traits between their behaviours and some things that are unique to each variety. The first thing you should try and establish is what, if anything, has drawn them to your home or business. Check for food and waste being left exposed, blocked or overflowing drains or in the case of rodents holes in the base of your external walls, doors, vents or under your fascias where they could be gaining entrance to the building. Taking care of these problems should always be your first port of call as solving these issues gives you a chance to prevent the problem from escalating. Once you have sorted anything that might exacerbate the situation, then it is time to handle the core of the problem. Depending on the type of pest and level of infestation, you might be able to handle this using over the counter products, but be warned poisons are a dangerous thing to use unless it is in a controlled and targeted fashion. More than likely by the time you are aware that you have a pest problem, the infestation is already significant. Take rats and mice for example, they are normally predominantly nocturnal and quite shy, so by the time you’ve spotted one there is probably a good sized nest nearby. 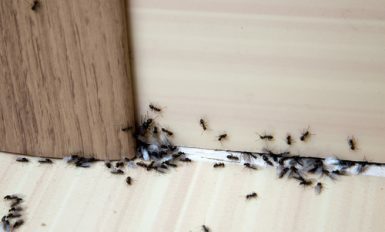 As such, a few traps are unlikely to be effective and in the case of insect infestations, if it is particularly bad the entire building might need to be evacuated and fumigated to handle the problem. The essential thing to take away from all of this is that pests come in a lot of different varieties and can be dangerous and destructive. 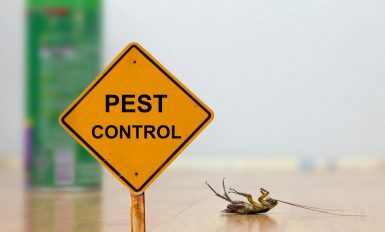 Ignoring even the smallest signs of a pest problem can lead to a rapid escalation of the situation and cause a lot more damage. Calling in the experts as soon as you have any suspicion will give you the best chance at minimising the expense of repairs and saving as much of your building as possible.